Joachim Gauck served as President of Germany from March 2012 to March 2017. 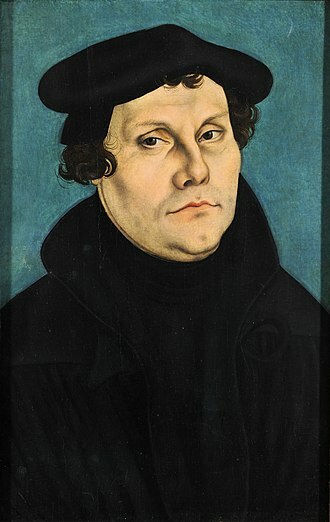 A former Lutheran pastor, he came to prominence as an anti-communist civil rights activist in East Germany, during the 1989 revolution, he was a co-founder of the New Forum opposition movement in East Germany, which contributed to the downfall of the Socialist Unity Party of Germany. In 1990 he served as a member of the freely elected Peoples Chamber for the Alliance 90. As Federal Commissioner, he earned recognition as a Stasi hunter and tireless pro-democracy advocate, exposing the crimes of the communist secret police. 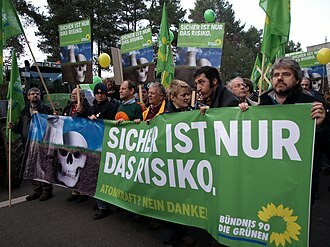 He was nominated as the candidate of the SPD and the Greens for President of Germany in the 2010 election, but lost in the draw to Christian Wulff. His candidacy was met by significant approval of the population and the media, Der Spiegel described him as the better President, a son of a survivor of a Soviet Gulag, Gaucks political life was formed by his own familys experiences with totalitarianism. Gauck was a signatory of the Prague Declaration on European Conscience and Communism, together with Václav Havel and other statesmen. He has called for increased awareness of communist crimes in Europe and he is the author and co-author of several books, including The Black Book of Communism. 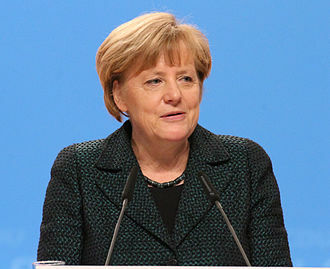 A Plea calls for the defense of freedom and human rights around the globe and he has been described by Chancellor Angela Merkel as a true teacher of democracy and a tireless advocate of freedom and justice. The Wall Street Journal has described him as the last of a breed and he has received numerous honours, including the 1997 Hannah Arendt Prize. 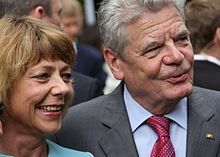 Joachim Gauck was born into a family of sailors in Rostock and his father was an experienced ships captain and distinguished naval officer, who after World War II worked as an inspector at the Neptun Werft shipbuilding company. Following the Soviet occupation at the end of World War II, when Joachim Gauck was eleven years old, in 1951, his father was arrested by Soviet occupation forces, he was not to return until 1955. 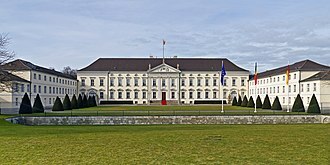 Bellevue Palace, located in Berlins Tiergarten district, has been the official residence of the President of Germany since 1994. It is situated on the banks of the Spree river, near the Berlin Victory Column and its name – the French for beautiful view – derives from its scenic prospect over the Sprees course. 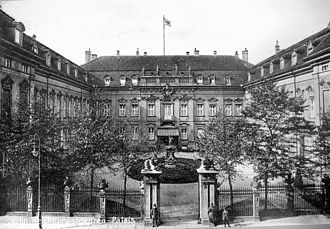 Bellevue was the first Neoclassical building in Germany, characterized by its Corinthian pilasters, the upper floor holds a ballroom designed by Carl Gotthard Langhans. 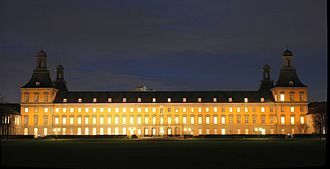 The Palace is surrounded by a park of about 20 hectares, in 1843, King Frederick William IV of Prussia acquired Bellevue, which, in 1865, became the residence of his niece Princess Alexandrine after her marriage with William of Mecklenburg-Schwerin. 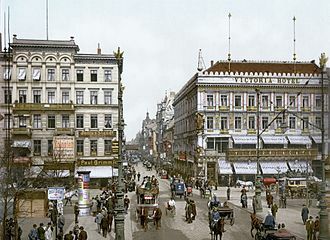 It served the royal and imperial princes of the Hohenzollern dynasty until the German Revolution of 1918–19. 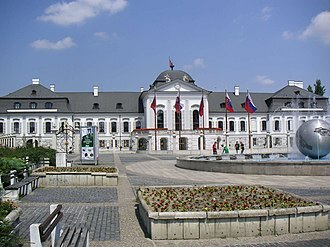 A property of the Free State of Prussia from 1928, the Palace was used as a museum of ethnography during the 1930s before being renovated as a guest house for the Nazi government in 1938. 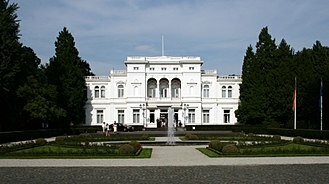 It was there that Soviet foreign minister Vyacheslav Molotov stayed with his retinue during his visit to Berlin in November 1940, during World War II, the Palace was severely damaged by strategic bombing and in the 1945 Battle of Berlin, before being was substantially refurbished in the 1950s. It was refurbished again in 1986-87, and, in 1994, after German reunification, a modern annex to the southern wing was built in 1998 to house the offices of the affiliated Bundespräsidialamt, a federal agency. 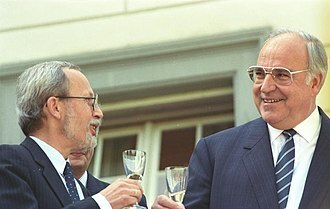 Roman Herzog, president from 1994 to 1999, remains the only officeholder who lived at Bellevue while incumbent, the Palace was reconstructed again in 2004 and 2005 to remedy defects in earlier renovations, during this period, President Horst Köhler used nearby Charlottenburg Palace for representative purposes. Bellevue became the primary official seat again in January 2006. 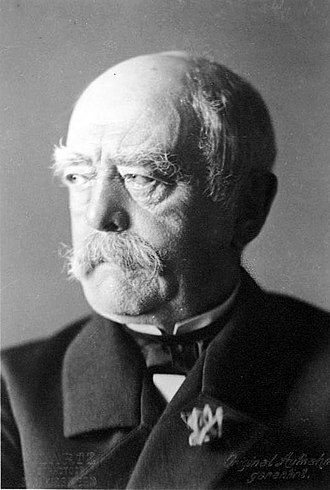 Instead, the Federal President now lives in a villa in Dahlem. 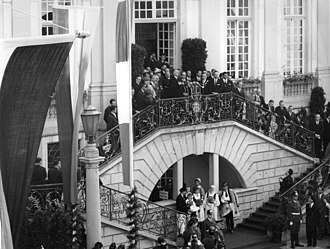 Contrary to popular belief, the standard is flown at the Palace even on many days when the President is not in Berlin. Meeting with his Argentine counterpart Cristina Kirchner. With then-President of Russia Dmitry Medvedev.